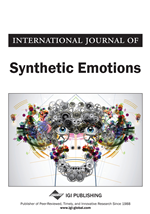 The recognition and display of synthetic emotions in humanoid robots is a critical attribute for facilitating natural human-robot interaction. The authors utilize an efficient algorithm to estimate the mood in acoustic music, and then use the results of that algorithm to drive movement generation systems to provide motions for the robot that are suitable for the music. This system is evaluated on multiple sets of humanoid robots to determine if the choice of robot platform or number of robots influences the perceived emotional content of the motions. Their tests verify that the authors’ system can accurately identify the emotional content of acoustic music and produce motions that convey a similar emotion to that in the audio. They also determine the perceptual effects of using different sized or different numbers of robots in the motion performances. The proposed work draws on several different areas of engineering. Several signal processing algorithms are required to analyze the acoustic music, dance theory is needed to determine how best to represent emotions with gestures, and knowledge of robots is needed to accurately control the humanoid platforms.